Martinsville Pics from Friday 4-12-2002 practice! Go down to the pic of the #36 "VOTE" car and click on the link under it to see them! Due to the fact that tripod has reduced their free space from 50 to 20 megs I have had to remove the following sections from my site! Hopefully (If it doesn't rain friday 04-12-02) I'll be at Martinsville taking video of practice and qualifying and will have pics from the tape up sometime next week. For the time being I can't afford to pay for the extra space here so I had to do this but I hope to be able to restore some things at a later date. Welcome to my Other Models and Nascar Pics Site! Here you'll learn all about my some of my other non-nascar creations including scratchbuilt Sci-fi models(Star Wars and Battlestar Galactica) and maybe later ...aircraft and other military models. I've also included a list of my favorite links to other sites. On this page, the "doorway" to my site, I'll introduce myself and talk about my reasons for creating this web site. I'll also talk about My interest in modeling all the other models that I will be showing off here! I still have the on the bench section with pre assembly pics of some of my nascar models. Also there are some non modeling nascar pages here... Martinsville pre-race practice pictures and winston cup preview pictures. 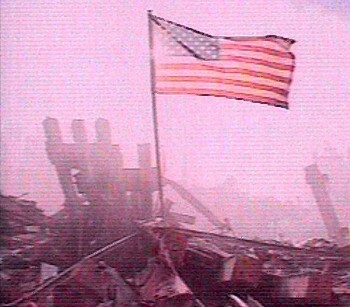 FROM THE EVENT WHICH I ATTENDED ON SAT.1-19-2002! The purpose of this site is to supplement my Nascar Modeling Center site which has all of my completed nascar models! This site has my nearly 4' long scratchbuilt Battlestar Galactica, and my scratchbuilt Star Wars models, including an AT-AT walker and the Milinneum Falcon! Please be sure to check back!!! 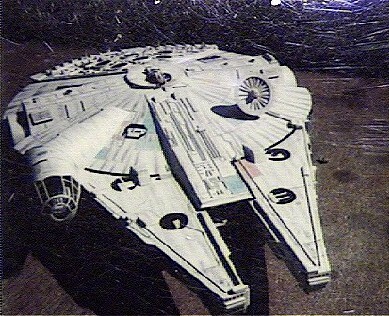 This is my scratch-built Millennium Falcon model from Star Wars! To see it and my other scratch-built Sci-fi models just click on the link up top! 2002 Nascar Winston Cup Preview Pics! 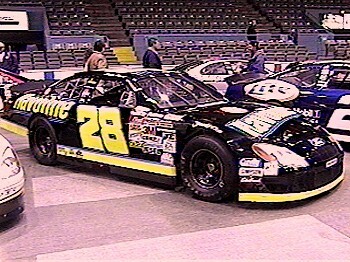 This is my 2002 Winston Cup Preview Pics site... there you will find captures from my video of the cars that were at the preview! Click on the #28 picture above to see them! Welcome to my From the Bench page! There you will find models that I am currently working on... the Nascar models will be added to the Modeling Center site when finished (You can find the link for it in the upper left section of this page)in various stages of completion! 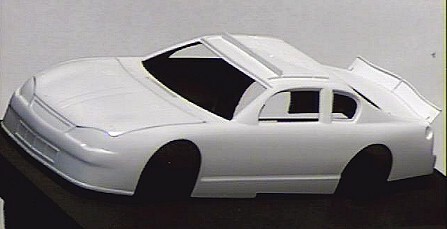 Click on the image of the Monte Carlo body above to see what's new on the bench!